An unforgettable class reunion: (top row L-R) Patrick Fabian, Giancarlo Esposito, RJ Mitte, Michael Mando, Dean Norris, Aaron Paul, Vince Gilligan, and Peter Gould, (Bottom row L-R) Rhea Seehorn, Bob Odenkirk, Bryan Cranston, Anna Gunn, and Betsy Brandt. Reunion gatherings are a tricky thing. Held too soon, sometimes not enough time has passed to either create or sustain a nostalgic appreciation for days gone by; held too late, they sometimes merely turn into a meandering rehash of hazy recollections. Sometimes, however, they feel just right. Such was the case when the cast of Breaking Bad gathered at Comic-Con to celebrate the 10th anniversary of the show, which ran for 62 episodes over five seasons, from 2008 to 2013 garnering seven nominations and two Golden Globes as it made television history. Held in the San Diego Convention Center’s packed, 6,500-seat Hall H, the celebration was a love-fest that proved enthusiasm for the labyrinthine, precision-crafted drama, the story of cancer-stricken high school chemistry teacher Walter White’s descent into darkness by way of the drug trade, hasn’t dimmed one bit in the intervening years. A four-and-a-half-minute highlight reel of the series, set to “Happy Man” by Jungle, kicked things off, after which moderator Bill Burr (who also appeared on the show, as one of Saul Goodman’s hired hands) welcomed Breaking Bad creator Vince Gilligan and cast members Bryan Cranston, Aaron Paul, Anna Gunn, Dean Norris, Betsy Brandt, R.J. Mitte, Giancarlo Esposito and Bob Odenkirk to the stage. Paul won the introductions by appearing with his five-month-old daughter Story dressed as up in the trademark yellow hazmat suit his character, Jesse Pinkman, frequently wore on the series. The easygoing rapport and genuine goodwill of the assembled cast members was on display as they shared several amusing anecdotes about both the production of the series, their recent gathering for an Entertainment Weekly reunion cover shoot (the iconic RV in which Walter and Jesse cooked meth still runs, it turns out) and the trajectory of Breaking Bad’s growth, from a small, critically praised but cultish show to an era-defining juggernaut. With Breaking Bad’s prequel spin-off approaching the timeline of the former show, Gilligan definitively stated that fans wouldn’t see Walter or Jesse on Better Call Saul during its upcoming fourth season. “But I think we would be sorely remiss if we didn’t have these guys on the show before it ended,” he said, in his warm and welcoming Southern drawl. Gilligan did, however, mention that other characters on stage for the Breaking Bad reunion could appear sooner rather than later on Better Call Saul, and Odenkirk strongly hinted that Norris, who played DEA agent Hank Schrader, might be among the first. “Based on the first time we see them together in Breaking Bad we know something bad happened (between Saul and Hank), so let’s find out what it is,” Odenkirk shared. Toward the end, Cranston reflected on Gilligan’s gifts as a writer, as well as his personal character. “Basically it was one big trust exercise,” said Cranston. “All of us on both this and Better Call Saul signed up to say take us on a journey, we fell back into (Vince’s) arms and he carried us all the way.” In another aside, Gilligan returned the love by urging aspiring writers to both listen to the emotional integrity of their characters and also embrace the inherently collaborative nature of working with actors. “We took cues, unbeknownst to them sometimes, off of these actors, and fused the writing with their personalities, to make the show richer and its storytelling more interesting and better,” Gilligan said. 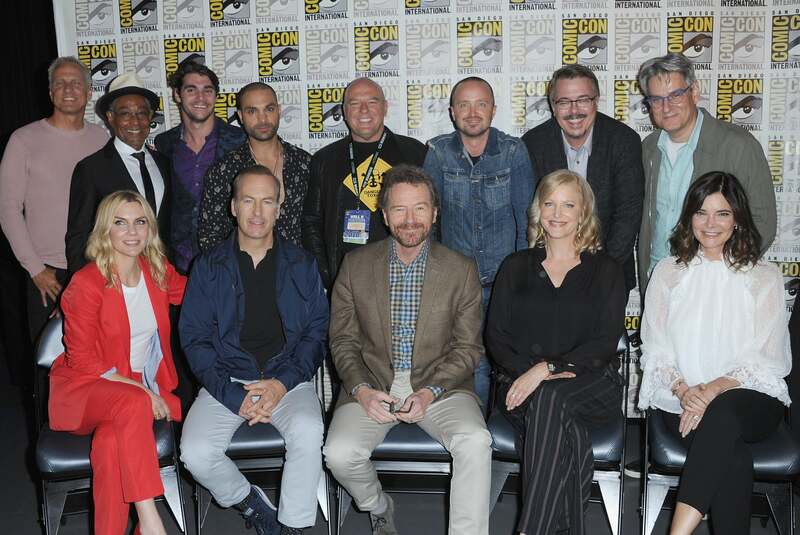 In the fan question-and-answer portion of the panel, Gilligan and the cast were asked about Fear the Walking Dead invoking “Heisenberg,” Walter’s criminal name, and the fan theory that the two shows shared a universe (“Well, Walt is dead so he could actually be a zombie now,” Cranston joked), as well as the possibility of a Breaking Bad movie. Noting his deep love for the entire creative team, Gilligan said he wouldn’t entirely rule it out. “I love that question,” he said. “And never say never. We live in a world fraught with possibilities, both good and bad.” It’s the embrace of that duality that helped make Breaking Bad such a singular experience and hit with fans worldwide.